Assembled Group Sterling Hollowware, 7 items. 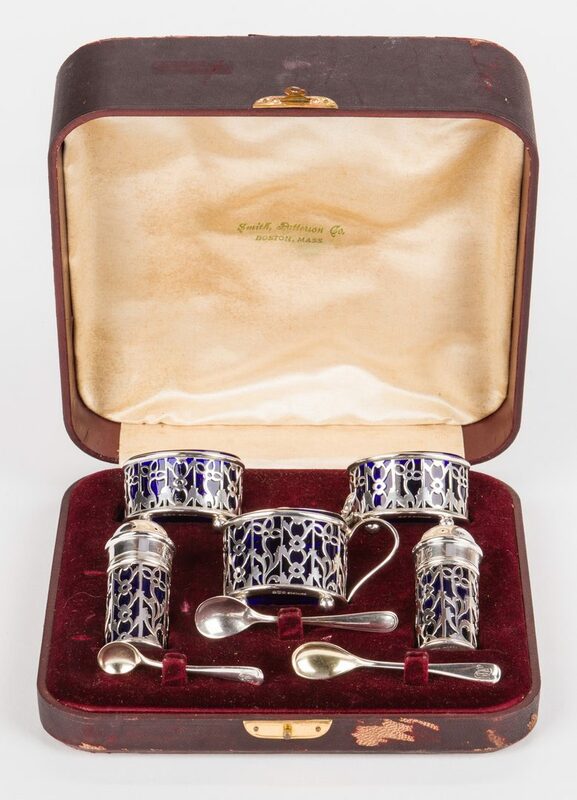 1st item: Boxed Gorham sterling silver and cobalt salt serving set, comprised of eight (8) pieces including one covered salt cellar, two open salt cellars, salt and pepper shakers and three salt spoons. 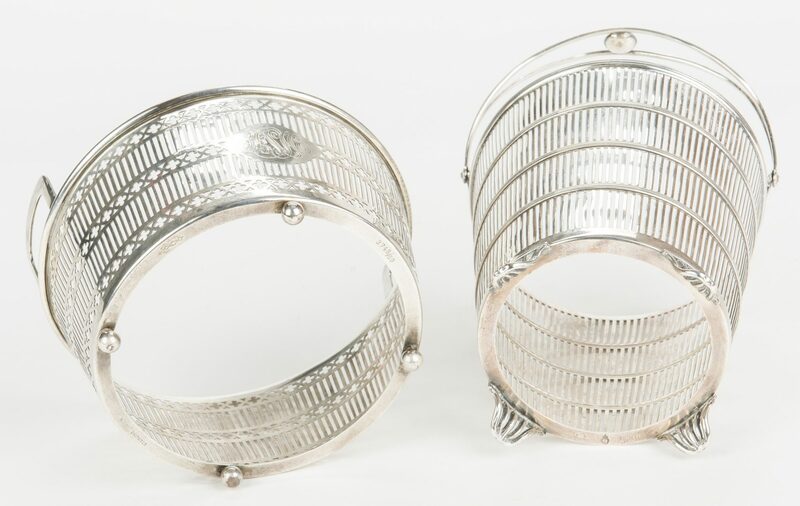 All salt cellars with reticulated silver bodies, ball feet and cobalt liners. 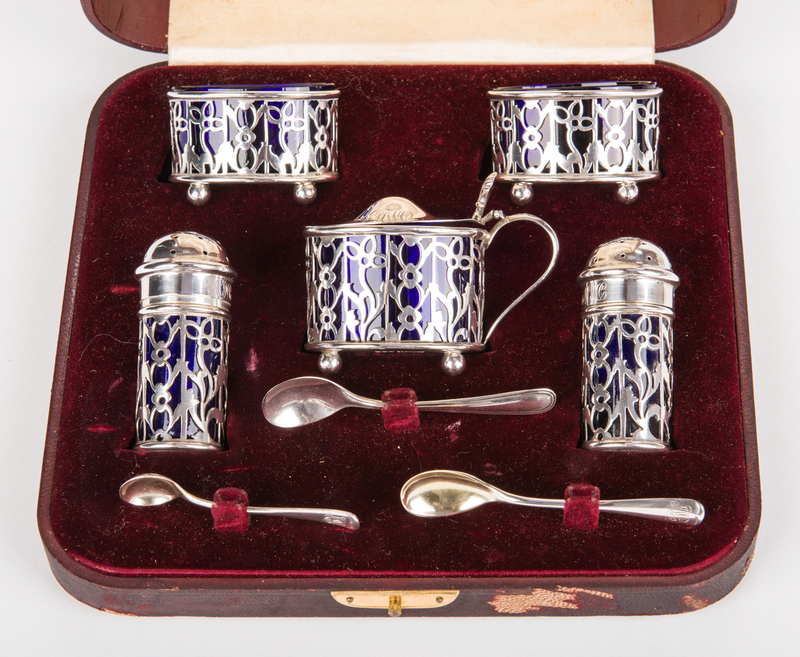 Shakers with reticulated silver bodies and cobalt liners. All pieces with the exception of one spoon are monogrammed and marked "Sterling" with Gorham silver marks. One spoon with marks for Webster Sterling Company. 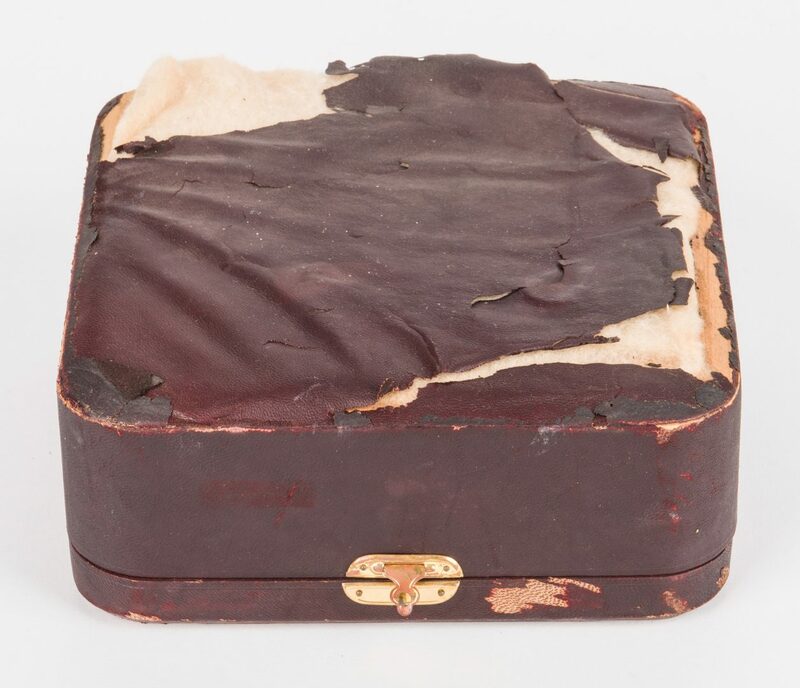 All housed in the original retailer box for Smith, Patterson & Company, Boston, Mass. Box measures 2 3/4" H x 7" x 7 1/4". 2nd item: Watson sterling silver ice tub, with reticulated tapered body, hinged handle and scroll feet. Marked on the lower rim with maker's mark for Watson, additionally marked "Sterling and #44". Monogrammed on body and fitted with a silverplate liner not original to the piece. 6 1/4" H x 5 3/4" dia. 6.620 troy ounces (tub). 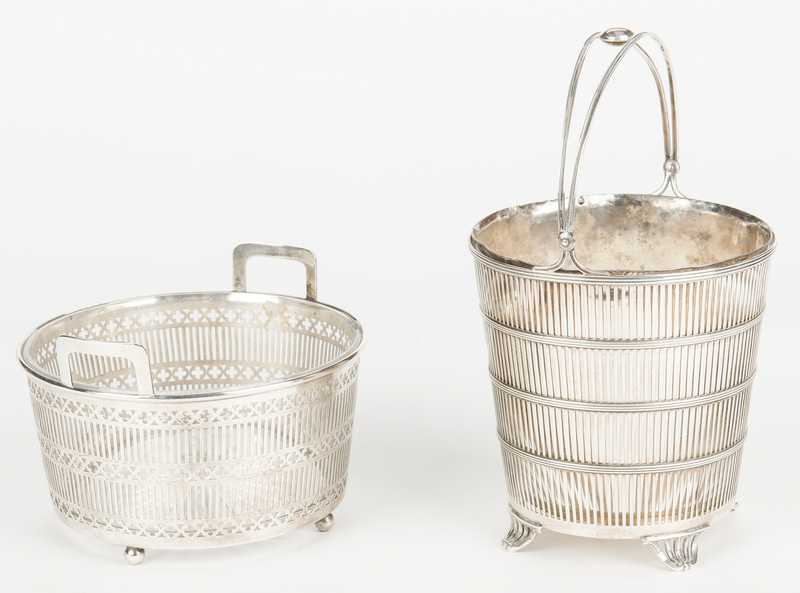 3rd item: Sterling silver ice tub, round reticulated body with handles and ball feet. Fitted with glass liner. Maker's mark to base along with "Sterling" and numbered 3745/69. 4 1/4" H x 6 5/8" dia. 4.950 troy ounces (tub). 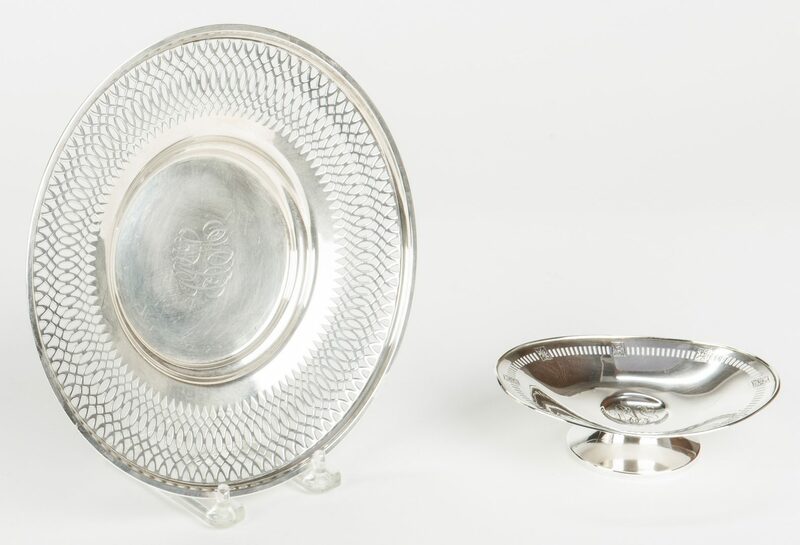 4th item: Whiting sterling silver serving plate with wide reticulated rim and monogram to center. Maker's marks to base along with "Sterling and #6759". 8 3/4" dia. 5.735 troy ounces. 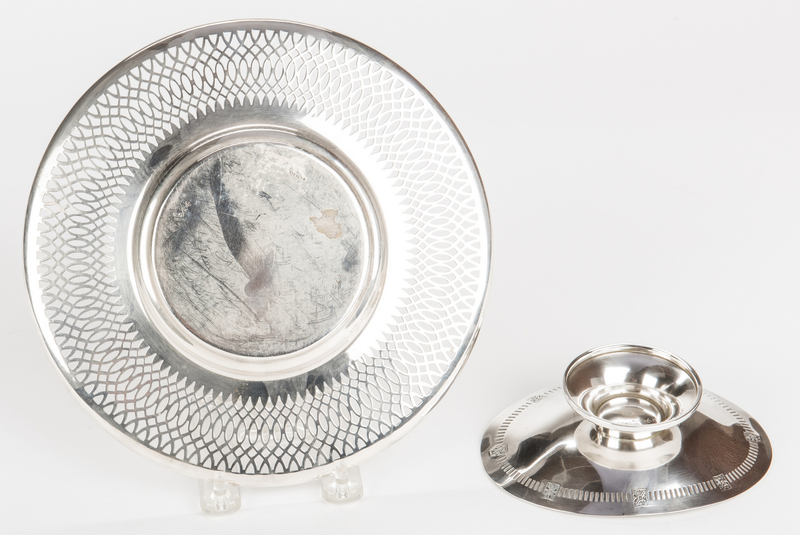 5th item: Dominic & Haff sterling silver nut dish with footed base, reticulated rim and monogrammed center. 1 1/2" H x 4" W x 5 1/4" L. 2.185 troy ounces. 6th & 7th items: Pair of cut glass salt and pepper shakers with sterling repousse tops. Tops marked sterling with illegible maker's mark on the side. 2 3/4" H. 19.49 total weighable troy ounces. CONDITION: 1st item: Box wrapping in poor condition, losses throughout. One spoon not original to set, later replacement. 2nd item: Plated liner not original, otherwise overall good condition. 3rd item: Chip to rim of glass liner, monogrammed, bucket overall good condition. 4th item: Very good condition. 5th item: Very good condition. 6th & 7th items: Wear to tops, some inner corrosion. Chip to base of one shaker.